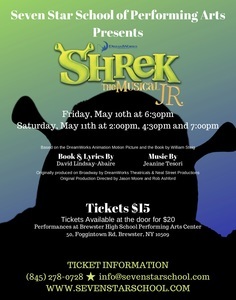 On May 10 and 11, students of Seven Star School of Performing Arts will perform Shrek JR. at Brewster High School Performing Arts Center in Brewster, NY. Tickets to Shrek Jr. are $15 prior to May 10th and $20 at the door. For any Girl Scout Troops looking to attend, We have a very special offer! For only $10, each Girl Scout will receive: 1 Ticket to Shrek Jr., a Pair of Shrek Ears and a Goody Bag. Also, The first 45 Girl Scouts to purchase a ticket to Shrek Jr. will receive at Theater Fun Badge and for every 10 tickets you purchase, you will receive one free chaperone ticket! Tickets must be purchased in advance by May 3rd. We offer a variety of fun, exciting and entertaining Summer Camps from July 8 – August 23. Visit www.sevenstarschool.com/summer to see a list of all our summer camp option, pricing and registration information. The Brewster Breakers recently competed in their second crew battle with Kids Breaking League. We are so proud of our students and after several grueling battle rounds... they won! The kids were jumping up and down with excitement and were so proud of their accomplishment. They trained very hard for this win and are so eager for more battles to come. The SSSPA Dance Dads are back in 2019 to defend their title for 'Best Dads Dance' at the Kids for Kids Dancing for Life Competition at North Haven High School on Sunday, April 28! This year, in conjunction with three other Dance Dads teams from competing studios are working with Camp No Limits, a non-profit organization 501 (c)(3) providing camps for children with limb loss and differences. The camp aims to provide education, mentorship, and support to these children and their families. 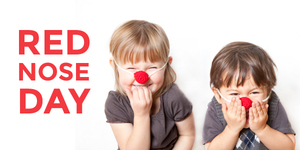 Every year, thousands across America buy Red Noses and go Nose to Nose to raise awareness and funds to help children in need. Simple yet powerful, visible and playful, the Red Nose has been a symbol that brings us together, breaks down barriers, and reminds us of the power of laughter. Red Noses will available for purchase at the front desk the week of May 20th. Each Red Nose will cost $2. Any students who purchase and wear a nose can wear a leotard of their choice they don’t have to be in dress code!